Roughly chop 1 onion. Heat 1 tbsp vegetable oil in a large saucepan and fry the onion for 4–5 minutes. Stir in a 200g jar Cooks’ Ingredients Keralan Curry Paste, 25g piece fresh root ginger, finely chopped, and a 227g can chopped tomatoes. Cook gently for 10 minutes. 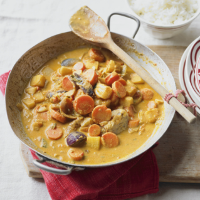 Tip in 600g frozen essential Waitrose Winter Vegetable Mix and a 400ml can essential Waitrose Half Fat Coconut Milk. Bring to the boil, reduce the heat and cook gently for a further 10 minutes. Serve with basmati rice.